One evening last week, I headed to the stylist for some overdue maintenance. Typically on these trips, I allow myself the senseless pleasure of catching up on celebrity gossip via the glossy magazines sprinkled throughout the salon. But on this night, I was feeling scholarly, or something like scholarly, with a tendency toward better hair. The idea of improvised action occurs in the day-to-day work of teacher leaders…standing at the copier, discussions amidst hall monitoring, waiting-for-the-meeting-to-begin conversations, etc., and this, I believe, is where all the difference can be made. These improvised moments of leadership are about knowing how to respond when the curtain is down and the audience is just you and the person (or persons) you have in your company. No spotlights, no elaborate sets, costumes or props…just you and the art of leading. This idea isn’t news to me. 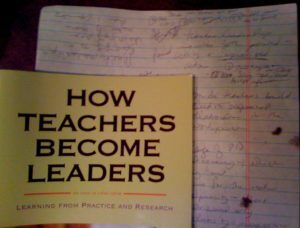 I’ve been jumping up and down about it since I began training teacher leaders several years ago. What struck me was the parallel between this notion and theatrical improvisation, and that’s where my brain started swirling. Think for a moment of when you were called to lead at a moment’s notice and you recall making a real difference. Which of these principles came into play? Did you honor the voice of a smart colleague that rarely gets adequate air-time in front of peers? Maybe you shared a personal story of accomplishment regarding a student other teachers have written off. These subtle moments where for a split second your improvisational muscles flex for the greater good, are the very moments you play the most significant part in leading your peers. We’re all called to lead in our own way, whether we’ve been cast as leaders or not. Brush up on your improvisational skills, and see what kind of scene you can make.